The Photo Lucky Draw Software is fun and easy way to find a winner. It can roll the participants photos quickly and randomly, and when you click the Draw button, Winners will be drawn out. Winner's photo will not repeat until initialization.You can customize the background image, music, photos folder, title and grade of prize etc. Be used with projector, you can create yourself lucky draw at your party, if you use it,you will find it is very interesting! Photo Lucky Draw can also be used for text draw. The utility helps find a winner on a random basis, based on photographs. Lucky draws are often conducted at parties to enliven the proceedings. It is usually done based on some token of its owner. This could be a visiting card, the car keys or any such items. This utility brings in the possibility of drawing a winner from a given set of photographs. The program selects a random one from the given list of photos. Besides the top winner, it can also select more prize winners as defined by the user. As long as the program is not initialized again, it will keep drawing winners leaving out the previous winner, of course. It will take the equivalent of a shake, rolling the photos of the participants. Then, when you click the draw button, you get the next winner. To make the whole prize drawing process more interesting you could define your own background, music, photo folders, title and grade of prize etc. When used with a projector, the game becomes even more interesting and a roomful of people can watch the proceeding and have fun. Besides the photo mode this tool can also support numbers and name modes. You have a choice of skins. Import of the name and numbers from an external text file is available. The interface is simple and any party giver should be able to get up to speed with it very quickly. The display could be full screen too. 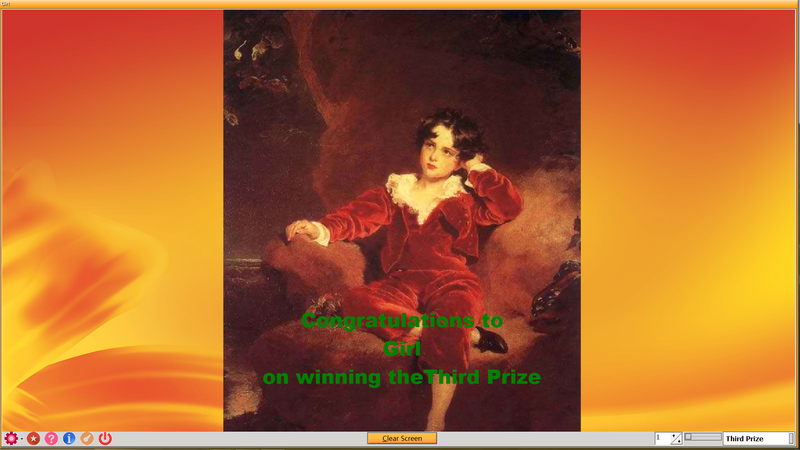 The display is mainly the photograph; it can have an overlay of the name of the winner too.